How much can I expect to lose on average each week? This topic contains 28 replies, has 19 voices, and was last updated by jadabrown 1 year, 4 months ago. I have been on the 5/2 for two weeks now. At the end of week one I had lost a staggering 2KG! At the end of week two I have lost nothing, which seems odd. Also quite constipated. Is this common? The average weight loss for a woman on 5:2 over time is about one pound a week. Your initial weight loss was mostly water weight. The weight loss will not be ‘constant’. You will lose a couple of pounds, not lose for a week or two, and then lose again. Try measuring your waist. During the time I had “no weight loss” I lost cms. I have been on the diet now for 5 days now and lost 0.8kgs. I don’t know if I should be disappointed or happy with the loss. I am having trouble with the app – as I didn’t start on a monday all the days are out of sync. Anyone else had this problem? I answered that question in my post above – about one pound a week over time, not consistently, more or less depending on your TDEE. Numbers 1 and 4 in the thread posted will explain more. I am on my fifth week of 5:2 and it’s mostly been great. I had one slip up last week, but I do think it was because I was a little under the weather. I have been losing about a pound a week. However, before 5:2, I hadn’t been able to lose anything and had been slowly gaining for 4 years, so I’m excited for the scales to be moving down. I’d love to be a buddy for you :). Checking the forum on fast days has replaced my snacking :). The first two weeks are the hardest. I haven’t felt any discomfort today (a fast day first) and this is my 9th fast. Keep going, it’s worth it!! Simcoeluv, do you have any info. on 5:2 and it affecting your metabolism? 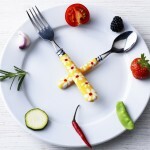 My friend (who is a health / fitness nut) gave me a hard time about it (fasting) last week. Thanks! In my opinion, metabolism is one of the most misused words in the diet industry. They say you can eat foods to increase it, do things that will reduce it, and bad things will happen if you monkey with it. If you have any interest, here is a very basic, non-text book description of metabolism: http://en.wikipedia.org/wiki/Metabolism. If you can get through the first three or four paragraphs without quitting, you are a biology major, maybe with a graduate degree. I even don’t care to read it. The thought that personal trainers and diet book writers can speak about it intelligently is – surprising. Research has shown that a person’s metabolism cannot be changed by exercise: http://www.ncbi.nlm.nih.gov/pubmed/1550061. For layman’s purposes, your metabolism is roughly equal to your Basic Metabolic Rate. That is measured when you are not doing anything (think being in a coma). Your TDEE includes your BMR, but adds in calories expended because of movement. Eating, not eating, exercising, not exercising do not impact your BMR. Having muscle, not having muscle don’t either (look at the inputs for the calculation – muscle mass is not a factor). For the average person on a diet, TDEE is the basic number. If it is high, your daily caloric need will be high. If it is low, your daily caloric need will be low. As you lose weight, your TDEE will decrease (because it takes less energy to move around less weight). That means that to continue losing weight you need to eat less than you have been eating. And to maintain your weight loss, you need to keep eating at the now much lower level of caloric intake. People (especially diet book writers) try to make weight loss into a mystic thing, selling the latest concept. If they worked, everyone would be thin. They don’t. The less you eat, the more you lose. Thanks Simcoeluv, that definitely helps put things into perspective. It’s nice to not have to worry about “ruining” my metabolism. Emily I’ll be your buddy! 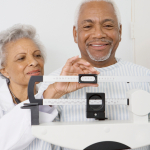 how has your BMI come down in the last 5 weeks? I had ten pounds to lose originally, and I’m down to 5 pounds to lose now. I don’t think my BMI has changed much, but I am in the normal range. How much do you want to lose? I’m looking at 5:2 as a way to lose some weight and get ahold of my horrible yo-yo dieting habits. I am already happier and confident. How are you finding your first few fasts? I am not currently counting calories on non-fast days, for me, that’s the beauty of this way of life. I love food and I can have whatever I want (tomorrow of course). I’ve been really boring with my fast day meals so far. I have a protein bar for lunch and a frozen diet meal for dinner. 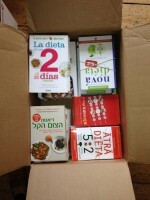 I reserved the fast diet cookbook from the library, so I’ll give cooking on fast days a try next week. Into my 9th week on the diet now and I have lost about a kilo a week. (I have a lot to lose!) What I have found is that initially the loss was quite fast and for the last couple of weeks I stayed around the same weight for the last couple of weeks. Hoping to break through the plateau by adding some more exercise and just sticking with it. I have just completed my first week and loved it…Found it very easy in fact. The only problem is that I have put on half a kilo and am very disappointed..I did have some chocolate and some lollies on a feed day….I thought we were allowed. But maybe I need to diet all week?? You might weigh 0.5kg more but that doesn’t necessarily mean that you have gained 0.5kg of fat, it could simply be that you are retaining more water at this week’s weigh in. Are you also taking body measurements? A lot of people find that more helpful, since it is possible to start shrinking without it showing up on the scales. You don’t need to diet on non fast days, but you do need to make sure you eat sensibly (below your TDEE). 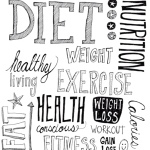 I wouldn’t worry too much after one week, but if you don’t see a loss at week two (or a shrinking waistline/ clothes starting to feel easier) then you may need to review what you’re eating each day to see if you over eating. My advice, don’t panic! It does work. Good luck. LucyKedi. You don’t mention what you drink. Dehydration is one of the most common causes of constipation. Perhaps worth increasing your water, herbal tea intake on your fast days (and maybe your non fast days as well). I’ve been fasting 5:2 for a month and have gained over a kilo … Could this be because I’m fasting from 2pm – 2pm, after and before lunch. Should I switch to morning to night? Eat change, hi the fast day normally lasts around 36 hours. For example on the Monday you eat normally have tea, you go to bed Tues you eat 500 calories, go to bed and on weds you can eat normally again. Also try not to over eat on your non – fast days. Have you checked the above link that since love has put higher up, that normally has a lot of answers there. Also check your measurements are they reducing? Hope this helps, someone else may have some other suggestions for you. How many calories are you eating before 2 pm one day and after 2 pm the next? If you lose a pound a week when doing the fast diet only, how much can you expect to lose if you are doing “fast exercise” also? I was disappointed to see that I’ve lost only 2lbs after three weeks of the diet but I realise that the slimmer’s worst enemy is impatience. It takes time to put weight on so it will take time to take it off. I find the Tracker very helpful to maintain motivation because I can see a clear downward trend among the peaks and troughs. Fast days have become quite easy already. The average weight loss on 5:2 is about a pound a week over time – less for women. So you are right on track. I’m afraid if you want to lose more quickly, you will have to eat less than you are currently eating. Thanks,simceoluv. I’ll check out the tips. How much weight can you lose in each week depends on many factors: how much you try, which way you try, in what shape are you etc. If you are doing everything well, you can lose maybe 2, 3 or 4 pounds per week or 4–8 pounds in two weeks. Fast weight loss may harm your health. Also, for some people, the results may not be visible at the beginning, so that doesn’t mean you should give up. Keep trying and you’ll see the results. I have kept to the limits and find 4lbs a week weight loss is a fantasy, and if I did lose 4lbs a week I’d be really worried and would see a doctor immediately! In less than 2 months I have lost 10lbs. Very pleased and persistence has seen off early concerns that the programme didn’t seem to be working. Fast days have got easier without any great pangs. I have also dispensed with my fear of exercise on fast days and usually take a long bike ride on those days. Stick with it and the results come through. I weigh myself each morning and put the weight and my comments on to the tracker.it is really motivatino to see the clear downward trend of the graph amid the ups and downs. I am as exact as possible about calories on fast days,weighing food and checking call via Web. On non fast days pretty relaxed but aim to cut sugar intake…no chocolate or cake but perhaps the occasional real Italian ice cream. intake deficit leads to constipation this is absolutely normal you can counter it with a healthy amount of water consumption, and yes this is absolutely obvious that your body will never respond like previous week as it is now accustomed to consequences happening to it. you need to stay focused and keep on going in the same direction. to up your output you can start taking “beyond weight management tea” this tea will stimulate your weight loss to a handsome amount.